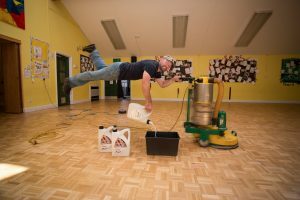 A guide to how much wood Floor sanding finishing cost Suffolk. Floor sanding and finishing cost in Suffolk, Essex, Norfolk and Cambridge. Floor sanding and finishing cost in Suffolk. The floor sanding finishing cost Suffolk for your project will depend on several factors. Firstly how hard or how much work is involved in bringing the floor back to life or how easy the work will be. Victorian floorboards with the black bitumen around the perimeter of the room. Can be the most work and time consuming compared to a oiled wood engineered floor that just needs a light sand. Also is there any repair to be carried out like loose or damaged boards that need to be fixed or replaced. Floor sanding finishing cost Suffolk and East Anglia. The size of the project you have, like if you have a small hallway to be done or have two or three large reception rooms to be sanded, stained and sealed. Or if the project is a domestic or large commercial area like a village hall or school floor. Where the square meter will be less the more of the size area you have. How far away from us will depend on cost. Our main catchment area for our work is Suffolk, Cambridge, Norfolk and Essex. But will travel further if needed. For the best and most competitive quote will also speak to you by phone or email first then provide a free site visit and then a written quote with no obligation. So whatever your wood flooring needs, whether it’s floor sanding and finishing or installation of wood flooring please get in touch I use a local supplier for fantastic quality french Oak flooring you can visit their showroom (we fitted their showroom).